I’ve discovered over the years especially before and after a gym workout that people will commonly use a foam roller to self-massage. This apparently has benefits to the individual and seems to be a way a person will manage muscle soreness pre and post workout. I’ve always been a bit sceptical about foam rolling as I never thought it really did anything beneficial and was more akin to stretching for the lazy. So I decided to look into whether there’s been any research into foam rolling and surprisingly there was, measuring different aspects of rolling, Ill discuss a couple below. The 3 studies that I’ll focus on today studied the benefits of rolling on the range of motion of a joint. Meaning after a workout was that joint able to move more as a result of the rolling. A few things stood out. The range of motion of the joint (hip extension) immediately increased after rolling the front of the thigh (quads) however these changes were short lived. When the patient was reassessed a week later there was no observable difference. Secondly in another study when foam rolling was performed along with stretching of the quads the range of motion in the hip joint was significantly greater than both rolling and stretching alone. This wasn’t just with the hip joint, there was another study that compared ankle motion. This study found that foam rolling of the calf alone did not produce any increase in ankle range of motion at all, where calf stretching improved the motion by 6.2%. However as with the hip example above, foam rolling plus stretching increased the range of motion by 9.1%. Studies into foam rolling are still in their early days, however there is some initial evidence that if you are going to roll, it’s important to stretch as well. The extra benefits from both stretching and rolling seem to exceed that of stretching or rolling alone. Also to make a bigger difference it’s important to roll and stretch regularly. You really should stretch and roll whenever you train even if it’s only 15 minutes and you focus on a different region each time. It’ll be more effective than rolling each muscle for 30 seconds then moving on. The long‐term benefits of these interventions are still unknown plus the physiological mechanisms responsible for these interesting findings still need more investigation. 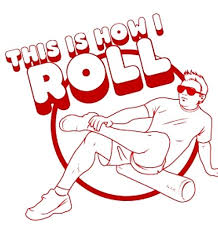 As for rolling to reduce the onset of muscles soreness the next day, I couldn’t find any articles that studied that in particular, so we’ll have to wait a bit longer before I comment on that one.